Detailed within a press release earlier today, Logitech is launching the Harmony Touch this month in the United States and Europe. The Harmony Touch offers a 2.4-inch color touchscreen that allows the user to add up to fifty different channel icons. Rather than having to scroll through the channel guide provided by a cable or satellite company, the user can simply tap the icon that signifies the logo of their favorite channel in order to switch to the correct station. The 2.4-inch screen shows up to nine channel icons at a time and more icons can be viewed by swiping up or down on the touchscreen. In addition, icons can be specifically positioned and ordered based on the user’s most watched channels. The touchscreen also allows the user to swipe to the left and right in order to bring up alternate activities. For instance, the user can switch from watching cable programming to setting up the home theater system to play a video game by changing activities on the screen. The number pad has also been shifted to the touchscreen, thus freeing up space on the rest of the remote control. Consumers that also own the Logitech TV Cam HD will find a Skype function on the Harmony Touch which can be used to place and accept calls, mute the volume during the call or control the camera’s zoom and angle. 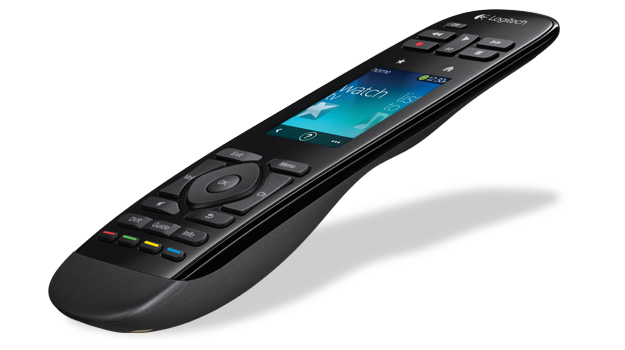 Similar to other Harmony remotes, the user sets up the Touch on MyHarmony.com to enable control of all components within a home theater. Similar to the Harmony One, the Harmony Touch uses a charging station rather than standard batteries. In addition to a smaller form factor, the Harmony Touch also offers back-lit keys for consumers that want to use their new remote in a dark home theater. While the Harmony Touch will roll out to retailers like Amazon and Best Buy later this month, it can be purchased for $249.99 on the Logitech site.